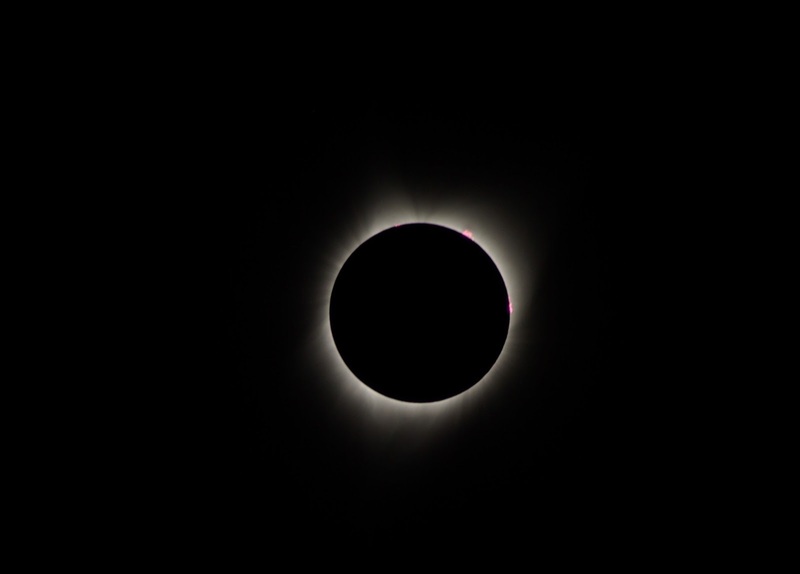 Totality during the 2017 Solar Eclipse as seen from Madras, Oregon. Note the prominences inside the Corona. Audrey McClellan Photo. The Great American Eclipse of August 21, 2017, is over, and most people who made their way to the narrow band of totality that extended across the United States from Oregon to South Carolina were rewarded with a clear view of a memorable total solar eclipse. I travelled nearly 400 miles in each direction by car and ferry from my home in Greater Victoria to Madras, a town of about 7,000 people in the desert of central Oregon, to see this celestial spectacle. Tens of thousands of other people also descended on Madras, including friends from across Canada and around the U.S. The group I watched the eclipse with included David Levy, the co-discoverer of Comet Shoemaker-Levy 9, and his wife Wendee. One of Madras’ big draws was its probability of good weather. That promise held true on August 21, but it was a closer thing than most expected. Smoke from nearby forest fires darkened skies just a few miles away from Madras during the eclipse. And though the weather in Madras was generally clear around eclipse day, clouds filled the sky just two days later. 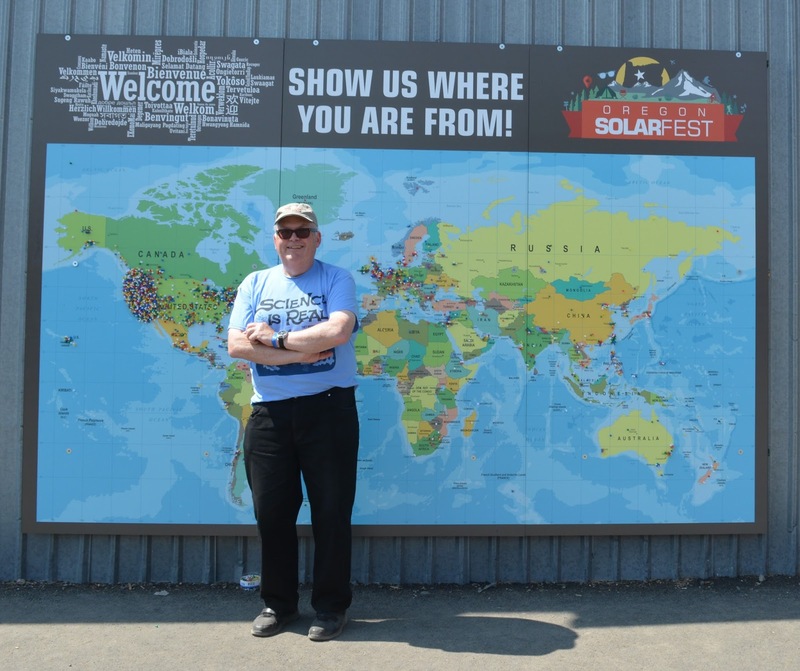 Madras also drew many revellers to the Oregon Solarfest held at the town’s Exhibition Grounds. A major New Age encampment widely compared to Burning Man took place not too far away in Prineville, Oregon. Madras also attracted many members of the news media. I was interviewed by CBC Los Angeles Bureau Chief Kim Brunhuber, who wrote a great article about the scene in Madras on the eve of the eclipse and broadcast my recollections of the 1979 total solar eclipse, the only one I had previously seen. "Somebody has pied the sun!" I said of that long ago eclipse. "It looked like somebody had stuck a pie plate in it." Watching the partial phase of the eclipse in Madras, Oregon. Chris Gainor Photo. Looking at a fully eclipsed Sun in person is different from any image of such an event because of the brilliant nature of the light coming from the Sun’s corona. During the 1979 eclipse, which I saw in Manitoba on a cold February day, the luminous white corona surrounding the blacked out Sun reminded me of cream from a freshly thrown pie. This time, I got a different impression of totality. During the two minutes when we could look at the eclipsed Sun without any filters or protection and view its corona, I had the more conventional feeling that I was looking at a ring of fire. The corona appeared to have a hint of yellow, perhaps an artifact of the smoke in the air around Madras. None of the photos that I or anyone else took showed that colour, though. Like many other observers, in 1979 I focused on the Baily’s beads and the Diamond Ring effects that mark the beginning and end of totality. This time I paid more attention to the dramatic and sudden arrival of the Moon’s shadow that darkens the landscape and the sky and lowers the temperature, followed by its equally dramatic departure at the end of totality. Something both total eclipses had in common: the period of totality flew by too quickly. In the short time of totality, there is so much going on in every direction that it is nearly impossible to take everything in. While it is fun to look through filters as the Moon moves across the face of the Sun during the partial phases, it is difficult to explain what an incredible sight totality is. For that brief period, you can just look up with your naked eyes and take in the strange sight of the solar corona and the dark sky around it. Venus and other planets are briefly visible. The corona's brightness usually and misleadingly appears in photos to be wispy. It is a whole different thing in person. That's why people travel hundreds and sometimes thousands of miles at great expense to experience totality. I am not an especially skilled astrophotographer, so I spent most of the two minutes of totality just enjoying the sights and sensations. My wife Audrey McClellan, on her first venture into astrophotography, got some excellent photos of the partial phases and totality, far better than anything I’ve ever got. While the crowds in Madras and other places in the band of totality were not as large as some people hoped or feared, they were still huge. Many local residents set up encampments on their land for last minute arrivals. We stayed 30 miles from Madras, and the drive back to our hotel took four long hours. At the Oregon Solarfest in Madras. Mary-Clare Carder Photo. Though large numbers of people in the U.S. and Canada were interested in the eclipse, many were quite content to see a partial eclipse and stayed home. Many of my fellow members of the Royal Astronomical Society of Canada who were unable to go to the U.S. for the eclipse wound up helping out at public events where large crowds of people waited to see the partial eclipse through properly equipped telescopes and scarce eclipse glasses. Back home in Victoria, the usual group of volunteers was depleted because so many of us were in the U.S. Those Victoria volunteers had to cope with crowds of hundreds of people who turned up at the Royal B.C. Museum, Mount Tolmie in Saanich, and the Metchosin Cricket pitch. I salute all those volunteers for their great work. Other people just arranged impromptu eclipse viewing events around greater Victoria. I was also pleased to see that B.C. Premier John Horgan stepped outside of his legislative office for a look at the eclipse. Smith Rock, Oregon, a favourite spot for rock climbers. Chris Gainor Photo. Those who stayed home also missed out on the fascinating sights that come along with travel. On our trip to Madras, I enjoyed visiting central Oregon, where the attractions include Smith Rock and the Cove Palisades State Park, along with the High Desert Museum in Bend. Like many people I know the coast of Oregon, and I probably would have missed the lesser known features of Oregon's interior had it not been for the eclipse. The next total solar eclipse in North America will take place on April 24, 2024, and its path of totality includes parts of Eastern Canada. I’m already thinking about where best to see that eclipse.